Anyway as with all the metal Malifaux models these this are fiddley, with small areas for the joins it is almost always in your best interest to pin them if you have a bit and rod small enough to do the job. Because they were all going on resin bases I had to clip the tabs on the bottom of the models and smooth out their tiny feet to get an area to drill into. Currently these are in the base coat stage where I go in and block out the majority of the color on the model and then apply a wash to add depth and bring out the details. 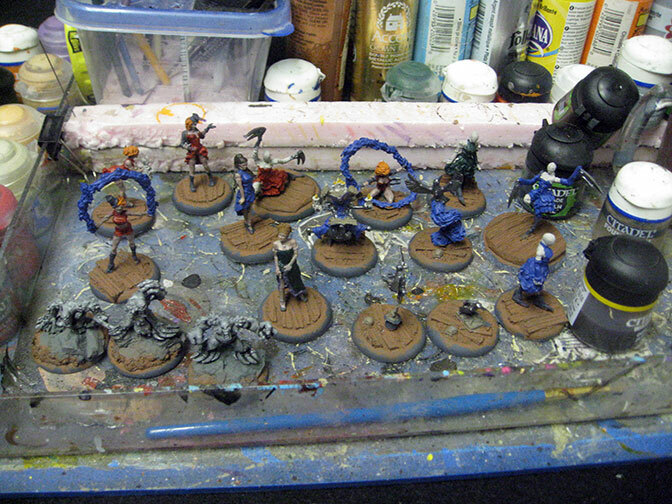 The next stage is to add highlights and pick out all the details on the models.